As recovery and rehabilitation facilities become more established and indispensable, the demand for addiction and recovery professionals is increasing. The Bureau of Labor Statistics (BLS) projects that positions for substance abuse, behavioral disorder, and mental health counselors will grow 23% between 2016 and 2026. Various job opportunities exist for students earning a master's in addiction counseling online. Moreover, professionals with this degree are generally placed into higher pay brackets than individuals with a bachelor's degree alone. A master's degree in addiction counseling varies among institutions, but most schools require similar coursework and projects. Common core courses are substance abuse counseling, biology of addiction, and techniques in counseling. In addition to coursework, some programs require thesis projects, internships, and capstones, each of which allows students to showcase what they have learned throughout their program. Students who graduate with their master's in addiction and recovery are often able to enter into successful careers as rehabilitation counselors, substance abuse counselors, and clinical case managers. What Else Can I Expect From an Online Master's in Addiction and Recovery Program? Virginia Commonwealth University ranks #1 on The 5 Best Online Master's in Addiction and Recovery Degree Programs! Virginia Commonwealth University collaborates with King's College London and the University of Adelaide in Australia to offer an addiction studies program with an international focus. This online degree track gives students access to international resources and awards a diploma from all three universities. The international addiction studies program emphasizes cross-cultural experiences and helps students build a global professional network. Full-time learners can complete this 36-credit master's in addiction counseling online program in 12 months, while part-time students can graduate in 24 months. Participants complete eight courses that cover various treatment methods for addiction, research methodologies, and policy. Classes draw upon international studies, applying information to policy work, program management, and leadership in the student's own country. The program culminates in an intensive, 12-week research project. Students write a 10,000-word research paper on a topic of their choosing, performing original research and/or analysis. Prospective students must apply by July 1 for fall entry into the program. Applicants should hold a bachelor's degree earned with a minimum 3.0 GPA and demonstrate high proficiency in English, although learners may substitute extensive professional experience for a bachelor's degree. Applicants should also submit three letters of recommendation and a statement of intent. University of South Dakota ranks #2 on The 5 Best Online Master's in Addiction and Recovery Degree Programs! The University of South Dakota offers a pathway toward licensure for students with and without previous certification in addiction services. This online program prepares students for the South Dakota Board of Addiction and Prevention Professional exam, which represents the top licensure in the state for the treatment of chemical dependency. Students who hold a bachelor's degree in addiction studies, possess level II or level III certification in chemical dependency, or work as licensed addiction counselors can earn their master's degree in addiction counseling online by completing the advanced track option. This track consists of 33 credits. Required coursework covers public policy, research, and case management. Students also take three elective credits in special topics, psychopathology, or working with families, diverse populations, or Native Americans. Alternatively, students without prior certification complete the standard track option, which consists of 45 credits. Learners can complete specialization courses in relapse prevention and psychopathology and addiction. Additional elective offerings include classes that cover gambling and process addiction; public policy and addiction; and wellness, recovery, and maintenance. All students complete an internship during their final semester. This three-credit course provides participants with a plan of study, which they complete in the field under extensive supervision. Prospective students must have a minimum 2.7 GPA in undergraduate coursework for provisional admission or a minimum 3.0 GPA for full admission into this program. Applicants must also complete an interview, which they complete either face-to-face or through videoconferencing. USD is regionally accredited by the Higher Learning Commission (HLC). The online master of arts in addiction studies program is accredited by the National Addiction Studies Accreditation Commission (NASAC). Washburn University ranks #3 on The 5 Best Online Master's in Addiction and Recovery Degree Programs! Washburn University, located in Topeka, Kansas, offers a master of arts in human services with an emphasis in addiction counseling that can lead to state certification as a licensed masters addictions counselor (LMAC) or a licensed clinical addictions counselor (LCAC). Students enrolled in this 36-credit master's in addiction counseling online program can complete coursework on a part-time or full-time basis. This program is offered in a cohort model with courses taken in a specific sequence. Full-time students typically complete the program in two years, although part-time learners may take up to six years to graduate. Core online coursework includes 30 credits of classes that cover human services, individual and group counseling, pharmacology, diagnosis, and research. Students also complete six credits of electives. Individuals who want to meet the requirements for licensure should fulfill their electives by completing the program's classes in integrative approaches and treatments of dual disorders and addiction and recovery services. Learners also carry out two practica within their communities. These practica include at least 200 hours of client contact and field work, 20 hours of supervision, and a weekly online seminar. Students select their own practicum site with approval from the department. A student's workplace may qualify if it meets certain requirements. Washburn offers students four levels of admission: regular, non-degree, provisional, and early entry. Students with regular standing must hold a bachelor's degree in human services (or a related field) earned with a GPA of at least 3.0 over their last 60 credits. Enrollees must maintain a minimum 3.0 GPA throughout the program. Distance learners from Colorado, Missouri, Nebraska, Oklahoma, and Texas pay in-state tuition. Washburn is regionally accredited by the Higher Learning Commission (HLC). The master of arts in human services with an emphasis in addiction counseling program is approved by the Association of Addiction Professionals (NAADAC) and the Kansas Behavioral Sciences Regulatory Board. Governors State University ranks among The 5 Best Online Master's in Addiction and Recovery Degree Programs! Governors State University, based in Chicago, Illinois, hosts a master's degree in addiction counseling online. To earn this diploma, students enroll in the school's master of health science in addiction studies program and select the addictions counseling concentration. The 32-credit MHS in addiction studies program is offered in a hybrid or fully online format. Students complete 29 credits of required coursework, including a four-credit internship, and three elective credits. Admission requirements include a minimum 2.5 GPA in undergraduate coursework with previous experience in behavioral sciences, biological sciences, and research methods or statistics. Students interested in earning licensure and pursuing a career as a counseling professional should complete the addictions counseling concentration. The coursework of this track covers legal requirements of professional practice, career development, clinical supervision, and assessment. Students complete a practicum and an additional internship, earning 11 total credits of practice-based education. The addictions counseling practicum focuses on screening and assessment of clients, intervention, and referral, while the advanced clinical internship broadens a student's experience in a clinical setting. Special admission is required to pursue this concentration. Applicants must have candidacy in the addictions studies master's program, hold a GPA of at least 3.5, and have earned a "C+" or better in all core courses. Governors State University is accredited by the Higher Learning Commission (HLC). The master of health science in addictions studies program is accredited by the Illinois Alcohol and Other Drug Abuse Professional Certification Association, Inc. (IAODAPCA). 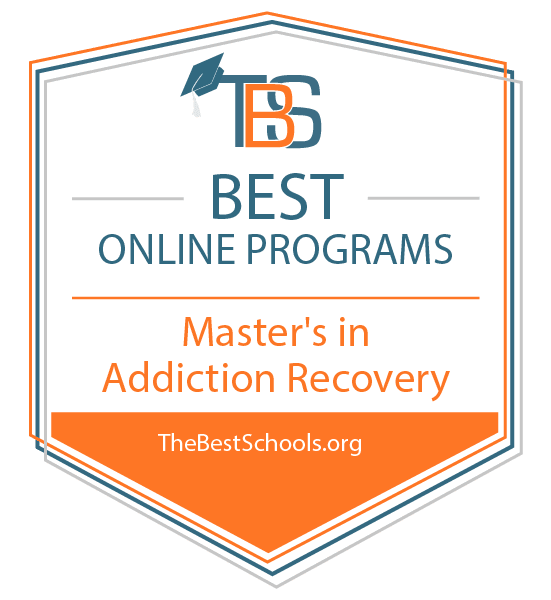 Hazelden Betty Ford Graduate School of Addiction Studies ranks among The 5 Best Online Master's in Addiction and Recovery Degree Programs! The Hazelden Betty Ford Graduate School of Addiction Studies is a premier treatment center for alcohol and drug addiction. The school's master's in addiction studies track is a hybrid program that requires students to complete three residencies in Center City, Minnesota. Full-time learners can finish the 60-credit program in six semesters (over a period of 24 months), while part-time students take 10 semesters to graduate. The program uses an integrated approach that covers trauma and differential diagnosis. Students complete 13 required classes and four elective courses. Participants choose from either clinical or academic elective coursework; clinical electives focus on internships to prepare students for licensure, while academic electives emphasize research, independent study, and specific topics related to addiction and counseling. The first four-day residency takes place during a student's first semester and serves as an introduction to professional co-occurring disorders counseling. The second residency, in group counseling for co-occurring disorders, is completed midway through the program. Learners carry out the final three-day residency in their final semester, focusing on integrated recovery. Coursework helps students prepare for Minnesota state licensure as licensed alcohol and drug counselors, licensed professional counselors, or licensed professional clinical counselors. Prospective students can apply for start dates in January, May, or September. Applicants should submit an essay and three letters of recommendation and participate in a personal interview. However, students need not submit their GRE scores. Hazelden Betty Ford is accredited by the Higher Learning Commission (HLC). The master's in addiction studies program is accredited by the National Addiction Studies Accreditation Commission (NASAC). Several universities offer online master's in addiction and recovery programs, teaching students about addiction, treatment, recovery, and how each affects the human brain and body. Again, while programs across the nation differ, they all equip students with in-depth skills in their area of interest. Treatment and the Recovery Process: This course teaches students how to examine treatment models of recovery, addiction, and relapse. Among the topics considered are how to develop treatment plans, how to research treatment outcomes, and how to understand the culture of recovery and addiction. For practical experience, this course combines research and hands-on activities. Stress, Grief, and Trauma: This course considers patients who have been impacted by acute stress, grief, trauma, and loss. Students learn about anxiety and depression and the different ways to treat patients who suffer from mental imbalances, survivor guilt, crisis, and trauma. They also study human stress responses to gain an understanding of how patients are impacted. Biology of Addiction and Recovery: This course examines addictive behaviors and substance abuse and how both affect the brain and human body. Students delve into brain anatomy to learn about biological aspects of addiction. They also investigate treatments for patients struggling with substance abuse and discern how those medicines impact the brain. National Certificate in Tobacco Treatment Practice: NCTTP certifies individuals to provide treatment to patients addicted to tobacco products. To qualify for the certification, individuals must have a bachelor's degree or higher, be tobacco free for a minimum of six months, and complete a training program followed by 240 hours of tobacco treatment practice. With the certification, individuals can pursue a career as a tobacco treatment specialist. Recovery to Practice Certificate Program: The RTP certificate program is for individuals interested in recovery-based practices for services related to addiction. The program teaches individuals skills, concepts, and practices related to recovery programs and garners more awareness about the benefits of those types of practices. To become certified, individuals must complete 15.5 hours of required coursework and 14.5 hours of flexible coursework. Individuals who have earned their master's in addiction counseling online have a variety of career opportunities available to them in a field with a steady growth rate. As indicated below, most careers are focused on providing advice, treatment, and care to individuals suffering from different types of disorders and addictions. Substance Abuse Counselor: Substance abuse counselors provide advice and guidance to individuals who suffer from alcoholism, eating disorders, drug addiction, and behavioral problems. They recommend and provide treatment to help patients overcome addiction and mental issues. Substance abuse counselors often work in private practices, community health centers, and prisons. Rehabilitation Counselor: Rehabilitation counselors care for and guide individuals with mental, physical, emotional, or developmental disabilities. They help patients learn how to live independently and overcome negative impacts of living with their disability. Rehabilitation counselors work in rehabilitation centers, youth guidance organizations, and senior centers. Social Worker: Social workers help patients cope with everyday problems, and they diagnose and provide treatment for individuals who suffer from emotional, mental, and behavioral issues. Social workers work in mental health clinics, settlement houses, human service agencies, hospitals, and private practices. There are two types of accreditation for institutions of higher education: regional and national. Regionally accredited schools are typically schools that grant degrees, while nationally accredited schools give certificates or function as trade schools. Regionally accredited institutions are more widely accepted than nationally accredited ones, largely due to the fact that credits from regionally accredited programs are easily transferable while credits from nationally accredited programs are not. Prospective students may look up accrediting agencies on the Council for Higher Education Accreditation's website, but most programs will cite their accrediting agency on their own websites. Keep in mind that some employers are unable to accept applicants who did not graduate from a regionally accredited institution, so it is important for students to research this information before choosing a program. Professional organizations are valuable to individuals in the addiction and recovery field for networking, sharing ideas, and further developing their careers. NAADAC, the Association for Addiction Professionals: NAADAC is a professional organization that represents 47 states, Canada, and other places abroad. Members work as educators, addiction counselors, and healthcare professionals focused on addiction prevention, treatment, and recovery. National Association of Addiction Treatment Providers: The NAATP is a nonprofit organization whose members, from the addiction treatment field, work together to collaborate on new ideas, communicate, and develop standards to practice in their work. American Society of Addiction Medicine: ASAM's members play an active role in creating government policies that affect their patients. Members have careers as physicians, clinicians, and other related professions in the area of addiction treatment and medicine.